Today, August 10,2018, Suzanne Collins celebrates her 56th birthday. 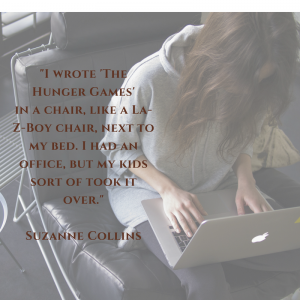 Suzanne is a television writer and novelist, and is Amazon’s best selling author of all time. She’s best known for The Hunger Games Trilogy, but back in the day she wrote for children’s programs on Nickelodeon, including Clarissa Explains it All and Little Bear. Suzanne Collins wrote The Hunger Games in a corner of her bedroom. I can picture her intended writing space, her office – cluttered with craft supplies and game pieces and action figures and a dress-up bin in the corner. I see her quietly closing the door behind her, turning, and stepping gingerly as she maneuvers past those painful plastic bricks strewn on the floor. At her ergonomic office chair, she removes Baby Doll and friends, carefully placed for a recent tea party, and arranges them on floor beside her desk. She takes a seat, indulges in a deep calming breath, and spins the chair towards her desk. And gazes at her horizontal surface, hers, and every single square inch is buried under youthful projects and folly. That glitter will turn up in her paperwork for eternity, and there’s those missing socks. And who thought they could hide a C- paper here of all places? Okay, I admit it. I’m describing my writing space, not Suzanne’s. I’ve never been to her place, and I expect she’s doesn’t have a glitter problem as serious as the mine is. But there it is. In-my-face visual evidence of the many competing priorities of my day. I’ll wager I’m not alone. I find it encouraging that people-way-ahead-of-me also slip away to a place of peace and quiet, where they can expel the mind clutter and get some words down. Suzanne Collins found a way and so will I. And so can you. 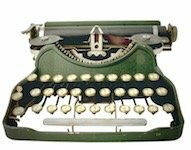 This post is the first in a little series about the logistics of writing. Where we write, how we get the words recorded, what tools we like to use – we each have a process. 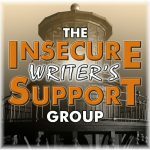 I’m going to share my thoughts and experiences; some worked, and some didn’t. I’ll delve into the whys and the what-fors, I hope you find purpose in these posts, and I look forward to hearing your thoughts. Gabrielle V. Brown has put words to paper since she could hold a crayon. 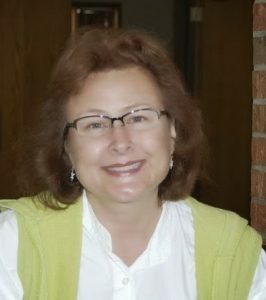 Her published work includes a variety of nonfiction, a ghost written memoir, and a cookbook. Gabrielle currently resides in the Rocky Mountains where she makes websites, plays with food, and writes stories and other stuff. How We Create Magic with Paper – Does It Matter? Now and then my posts include a link for a product I especially love. I may earn a commission if you click through and make a purchase.